Our bodies are full of cycles, little engines that keep churning like the gears of a machine, our heart that beats, our endocrine system. The world is full of them too, day and night, the changing seasons, and the celestial spheres. But our minds are also full of them, our habits and behaviors and even our thoughts. When I was a child, I began to detect cycles within my mind. As last year's season passed and the next year's season arrived, I began recollecting the things I did previously and missed them, and then did them again. But some things never fell on a yearly season, so I would occasionally remind myself to recall past events, and if I had forgotten about something worth doing I would take the time to revisit it, to retool and ramp up my activities. And each cycle I would try to improve upon the previous cycle. It reinforced my memories and prevented me from forgetting what was important to me. I didn't know at the time how important this little reminder within myself would be to my life. A cycle is like a circle, a 2-dimensional construct where the endpoint returns to the beginning, except that one of those dimensions must be Time. This bending of linearity into an infinite loop is extremely useful in the world, as humans discovered when they invented the wheel. But it has a great drawback. A cycle never changes, but keeps going round and round. A circle is just a straight line that is bent into the 4th dimension. Similarly, in physics, the orbit of a satellite follows a straight path according to Newton's first law, so why does it loop around our planet? It is because our planet's mass has bent space. We can describe this using the mathematical concept of "geodesics". In my mind, my focus was so great that I could bend my thoughts into a cycle like a magnifying glass, and my OCD latched on like a magnet. At first, this was a powerful tool, but sometimes, if I got too lazy or self-involved, I would be lost in the cycle, not accomplishing what I set out to do by the time I broke out of it. It wasted hours of time and drained most of my energy, like running a car full throttle in idle. I began to see cycles as traps or pitfalls for the mind, but, like I found with my exercise-induced asthma, I could initiate it to actually solve problems if I did it right. It gave me great power as long as I kept the power from corrupting me. I began to study exactly what a cycle was, and became fascinated with the circle, simple harmonic motion, and Pi. Trigonometry, which most people associate with triangles, is actually derived from the unit circle, a circle with the radius of 1. The line, the triangle, and the circle are parts of the same thing. As I began to study computation, loops, recursion, objects, and eventually fractals, I realized that the cycle was the engine that enabled growth, but like a car, nothing will actually move until you depress that gas pedal. The gas pedal of a cycle is "change" or perturbation. You have to initiate a change within each cycle to prevent it from looping. The cycle then explosively generates growth, expanding outward in wonderful detail. This is how fractals are born. where z and c are complex numbers (part real and part imaginary). The formula is then iterated, plugging the output back into the input, which can be easily handled by a recursive computer algorithm. Such a simple algorithm is like an organism that feeds on its input and grows as it feeds. The key is to break the cycle just slightly and apply what you learned into the next cycle. I have applied this to my own mind, starting a repetitive cycle, but being consciously aware of being in a cycle and modifying the cycle. In programming, this is called self-modifying code which allows "evolutionary algorithms" to exist. The important thing is that the code not erase the part of itself that maintains this awareness, but to instead reinforce it. My father also had an innate understanding of the cycle, having his own version of OCD, but he was not aware of fractals such as the Mandelbrot. 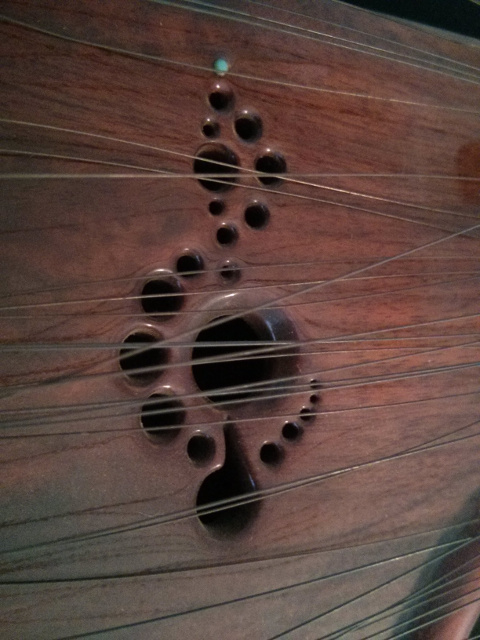 He built a wooden santur↗, and created a stylized treble clef at the top. If you mirror the entire symbol with the vertical axis of symmetry passing directly through the turquoise gem, it is a surprisingly close representation of the Mandelbrot Set (shown on the right, below). My father tapered the holes in such a way and applied polyurethane which allows point source light reflection in the holes to eerily match the tiny detail on the Mandelbrot. 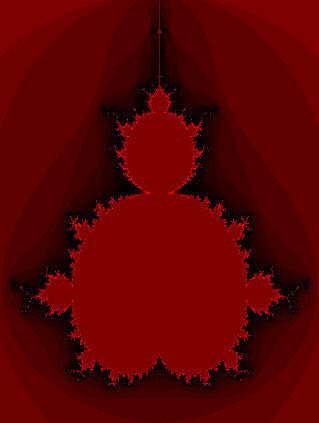 Notice on the original image that he stylized a curved hook at the bottom of the clef which matches the cardioid cleavage at the bottom of the Mandelbrot. He could have designed this hook in a variety of different ways, but he chose a style that matched the Mandelbrot more closely than the traditional style of a treble clef. Also notice in the mirrored image how the tiny circles of decreasing sizes at the bottom also cleave, like the cardioid. If you were to mirror the symbol using the big hole for the vertical axis instead, the holes do not line up properly and the cleave is not present. It creates double images. But if you mirror it along the turquoise gem, everything lines up just right and converges to a single image. And that turquoise gem is analogous to the tiny orb at the top of the Mandelbrot. It is fascinating that my father designed this symbol from his mind, never seeing nor understanding the Mandelbrot Set. 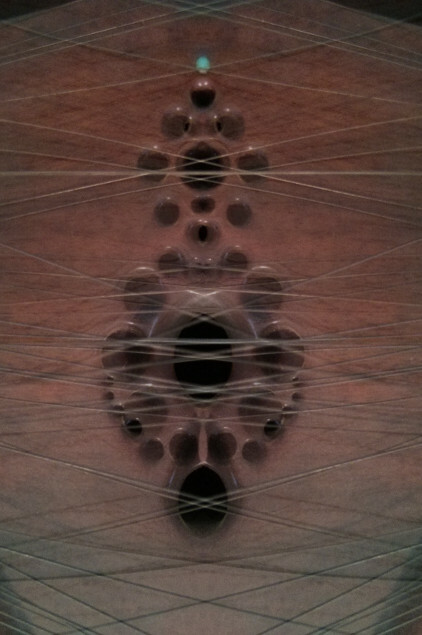 He used the treble clef as a blueprint, but it was his stylistic decisions that turned it into the Mandelbrot. His subconscious could see perfection and he tried to express it. Similarly, I have tried to express it in my LandmarkFilm but have not yet succeeded. This pattern exists within all of us, within our minds and the structure of the universe.